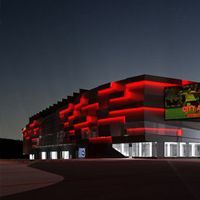 The most recent news about City Arena in Trnava is that of LED lighting being used to make the stadium and shopping centre glow red during Spartak Trnava’s football games. On other occasions it may change colours – a feature used very often in modern stadiums. Most visible effect may be expected on the presented south-eastern side, where façade of the stadium is integrated into that of the shopping centre conjoined with the stadium. The south side is also where most visible progress is being done right now as the south end was demolished last of all three stands making way for new ones. Altogether the new stadium will hold 19,000 people (with current main grandstand left standing), but should the west side also be rebuilt, it may grow to 30,000. With cornerstone installation and groundbreaking expected in the second half of September, construction deadline is just over 500 days away. We may expect fast progress, then, on what will be one of Slovakia’s two most modern stadia, including the new national stadium.